Whatsapp is one of the best social massaging platforms to share images and video with your friends and family. Whatsapp always tries to serve some better for their users. Why WhatsApp update their version. On November app intrudes stickers for the user. Sticker features already available for another massaging platform like Hike, Facebook. When you update your application, sticker feature found you on emoji section. Click emoji and you will found downside sticker options right after gif option. Whatsapp stickers pack available on play store. You can download and install in your WhatsApp. But there is very limited sticker pack available or not may be interesting stockers. Make personal whatsapp sticker, sound like making sicker on coding and sometimes like that. But that is very easy as like you edit your favorite photo on editing application. We will know that step by step. You use stickers on Facebook, Hike but you never use your personal sticker with your face. Yes, you can make a sticker with your face also. The following step helps you to generate your personal Whatsapp sticker pack. The step by step available. That is very to understand accurate step for making perfect stickers. If you want to make your own sticker for WhatsApp. Then you need some pictures with erase background. You can search it on Google with "Name + Without Background" or “PNG" images. Or you can create your own personal without background images using one application and one website. I personally use application for remove background. But you can use both if you want to use. 1. Remove Background with Application. 1. Download application using above link. 2. After download opens your application. 3. You will found a load image option. 5. Now crop as you want to use. and done it. 6. You will find an auto option in a down bar. Select it. 7. Now move a pointer on a background. Its automated remove match and remove background color. 2. Remove Background with Websites. You can also use a website for removing your photo background. Remove.bg is help you to remove your photo background. 1. Visit a website and upload your photo using select photo tab. 3. The website automatically edits and remove your background within 5 sec. 4. You can download images using a download tab. This website is totally free for use. But the website removes only human detected images. Both tutorial in this video please see all video. 2. Collect all in one folder and rename them as your interest. 4. Install the application and open application. 5. You will found all your images in this app with the folder name. 6. Click on add button front of your sticker folder which you want to add as a sticker in WhatsApp. 7. Now application takes some time to add this on a sticker on WhatsApp. 8. Open your application and search for the sticker. You can create multiple WhatsApp sticker using the same trick. remember one thing, just change the folder name. 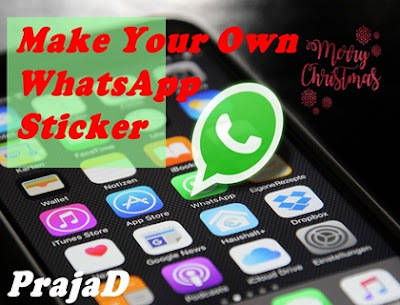 Share Personal whatsapp sticker with your friends and family and give them a surprise on this Christmas and New Year.